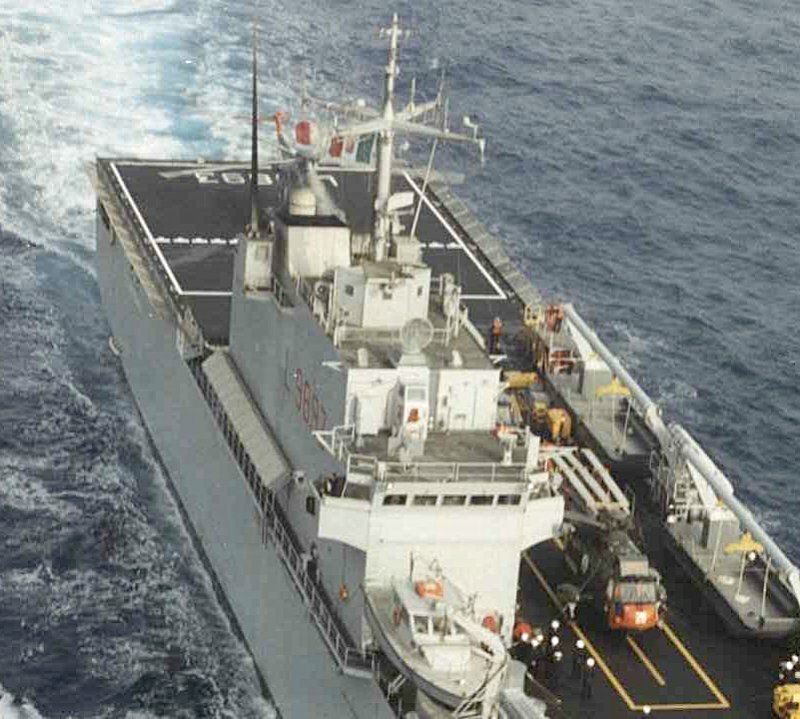 San Giorgio class small dock landing ships provide roll-on/roll-off landing capability for land embarkation; air lift through the use off high capacity aircraft such as Chinook-type helicopters; and transportation by sea to shore, using the ship's own systems and landing ships for landing on unprepared shores. The three San Giorgio class amphibious transport dock ships in service with the Italian Navy were built by Fincantieri at their Riva Trigoso shipyard. The ships provide roll-on/roll-off landing capability for land embarkation; air lift through the use off high capacity aircraft such as Chinook-type helicopters; and transportation by sea to shore, using the ship's own systems and landing ships for landing on unprepared shores. 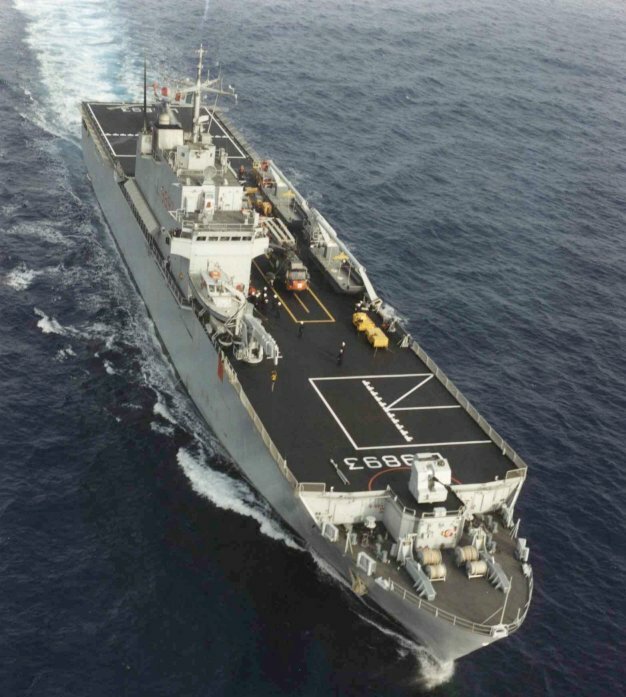 San Giorgio class LPDs are quite unconventional ships, based on a civilian ferry project. They were built in response to an urgent requirement raised with the italian deployment in Lebanon in 1982, and the foremost requirement was to be as cheaper to buy and to operate as possible. 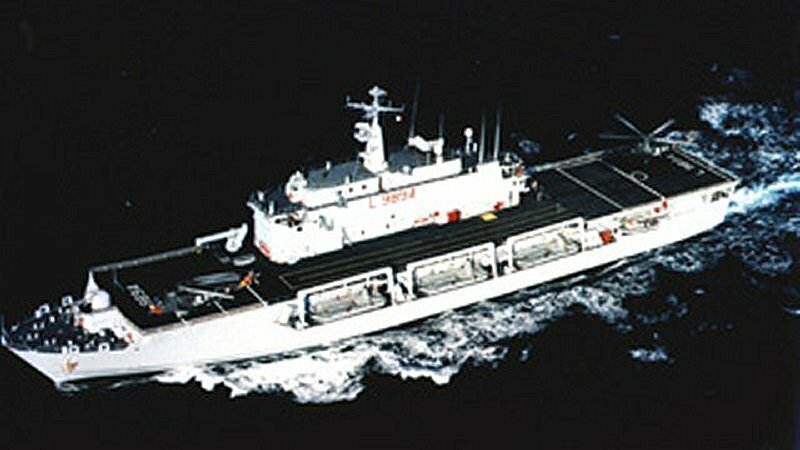 That requirement translated into a small hull, and an internal dock designed around the Italian MTM landing craft [a former US LCM dating back to the Korean War] and MEN landing craft, both less than 19 meters long and 5 meters wide. The San Giorgio class ships can lift a battalion of troops, with up to 30 medium tanks, or 36 tracked armoured vehicles. The stern floodable dock can accommodate three LCM (or MTM) landing craft. Details vary. 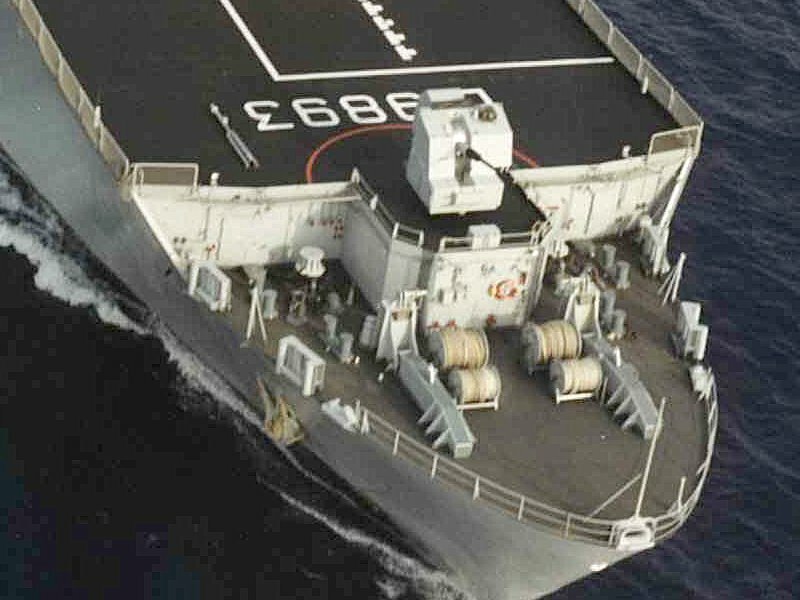 L9894 is configured as a training ship. 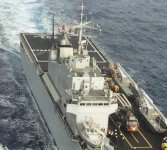 San Giorgio and San Marco were modified to increase the flight deck, allowing operation of four helicopters at the same time. The 76mm gun mount and two port side davits for LCVP's were removed, giving space for a new central spot on the flight deck. This will allow two EH 101 helicopters and two medium helicopters (NH 90 or AB 212) to be launched at the same time. The units of the San Giorgio class have been conceived to function as the transport of staff, means and materials for operations of military character but also for the aid of populations hit from natural calamities. They have the ability to transport, beyond to just the crew, approximately 350 men of the Saint Regiment Mark, together to 36 " VCC1 " (armored vehicle from combat) along with vehicles of varied types. The lodging, with relative accessories and services, destined to the transported staff, can be employed for the shelter of evacuated persons. The ships are in a position to supplying all the sanitary services, necessary hospital workers and of catering in case of ready participation. They have a allagabile river basin for the spillage of the MTM (Motion Transport Average). The hidden of prow and the door concurs the disembarkation express of all self-moving means is on beach is on equipped docks. They are equipped, moreover, of a system of reclamation of the surface of the usable sea in case of serious episodes of pollution and of a system of distilation of sea water for sweet water production. 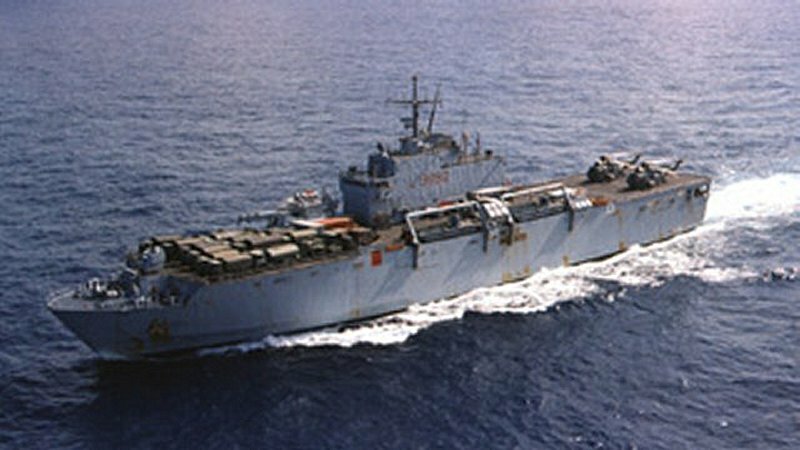 The Italian San Giorgio class Landing Platform Dock Amphibious Transport Dock ship provides roll-on/roll-off landing capability for land embarkation; air lift through the use off high capacity aircraft such as Chinook-type helicopters; and transportation by sea to shore, using the ship's own systems and landing ships for landing on unprepared shores. The ship has hospital and accommodation facilities which provide the capability for peace time rescue and humanitarian operations. The ship is also fitted for transporting logistic equipment, for embarking trailers, containers and other materials. The San Giorgio is equipped for civil defence missions with drinking water production plant to produce 210 tons per day, facilities for the co-ordination of pollution control for decontamination of heavily oil polluted seas and capacity for expansion of the ship's hospital and medical facilities. The ship's armaments consist of a main gun, the OtoBreda 76/62 gun, which is installed on the gun deck at the bow of the ship. The gun fires 6 kg rounds at a maximum firing rate of over 80 rounds per minute to a target range of 8.5 nautical miles. The ship is also armed with two Oerlikon 20 mm machine guns for close defence. The bridge deck is accommodated in the island on the starboard side. The main flight deck which runs almost the length of the ship, has three helicopter landing spots. The ship can accommodate three Sea King SH-3D helicopters or five Agusta Bell AB-212 helicopters. The San Giorgio can lift a battalion of fully equipped troops, with up to 30 medium tanks such as the Leopard, or up to 36 tracked armoured vehicles type VCC-1. The stern floodable dock, measuring 20.5 x 7 metres, can accommodate three LCM (or MTM) landing craft each capable of transporting 30 tons of materiel. While the dock is not in use, a movable cover installed over the dock allows the passage of vehicles through the stern ramp to the pier. Three davits on the main deck are provided for the deployment of three LCVP (or MTP) landing craft and a patrol boat. A 30 ton lift and a two- hook travelling crane, each hook rated to carry 40 tons, are installed on the ship providing the capability of autonomous loading and unloading operations completely independent of harbour facilities. The San Giorgio is fitted with a bow ramp for missions involving amphibious (beach) landings. The stern door is constructed in two sections, the lower section is the dock gate providing direct access to the floodable dock. The upper section of the stern door is hinged at the level of the vehicle or garage deck and acts as the stern ramp for embarking or disembarking from the pier. The propulsion system provides a maximum continuous speed of 21 knots. At the economical speed of 16 knots the maximum range of the ship is 7500 nautical miles.